Science has its own special language, like any field does. Sometimes the language or the pictures can be confusing, so I’ve tried to provide a glossary, or a sort of primary for some of the language that you might encounter on this blog that you may not be familiar with. I’ll try to keep it updated with things that will be appearing in other posts, but if there’s something you’re not familiar with, let me know, and I’ll put it in here! Chemists will often draw chemical structures in a sort of abbreviated way, to save us time, but also to quickly and efficiently communicate the structure. 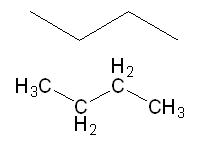 Chemical structures are typically represented as bent lines, where each bend stands for a carbon and enough hydrogen atoms to bring it to four atoms. Double bonds are represented by a double line drawn. 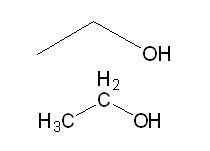 Similarly, triple bonds are drawn with three lines. Atoms that are not carbon can also be included in these drawings. Of course, there’s more we can discuss with structure. If you’re feeling really nerdy, there’s a lot more to read about it in other places. Proteins are chains of amino acids, often quite long. The also usually have some larger structure that affects how other molecules can interact with them, and, therefore, their function in the cell. For our purposes, the exact larger structure of the protein is probably not important, but again, if you’re curious, there are other resources where you can read some more about it.